The union of the territories of the County of Barcelona and the Kingdom of Aragon was brought by the marriage of Ramon Berenguer IV, Count of Barcelona and Petronila of Aragon. 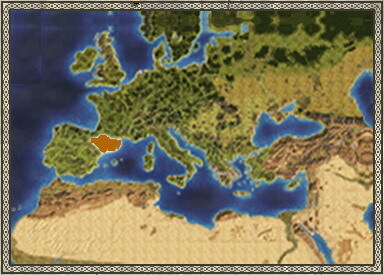 The resulting new kingdom came to be known as the Crown of Aragon. The son of Ramon Berenguer IV and Petronila, Alfonso II, inherit both the titles of King of Aragon and Count of Barcelona, in a style that would be maintained by all its successors to the crown. Thus, this union was made while respecting the existing institutions and parliaments of both territories. Elite light infantry skirmishers armed with javelins and swords, and sometimes armour. Based in Spain, the Knights of Montesa are loyal to the Crown of Aragon. Protected by light armour, these archers can take the role of light infantry as well. Based in Spain, the Knights of Montesa loyal to the Crown of Aragon. Excellent javelinmen and a good mix of infantry and cavalry.